Recently, Google provided insight into how one major concept is changing consumer behavior. The concept is known as micro-moments, and is considered to be the “I want-to-know moments, I want-to-go moments, I want-to-do moments, and I want-to-buy moments” that users come in contact with every day through their mobile devices. With the average individual checking their smartphone roughly 150 times per day, these moments are happening all the time. This means that as a business owner, it’s time to start thinking critically about your mobile strategy in an effort to capture people’s attention in these moments. Here at Zion & Zion, we have plenty of tricks up our sleeve in regards to our social media and mobile marketing strategies. And one of the most captivating ways to take charge of your mobile marketing is by joining Snapchat (if the platform makes sense for your business, demographics, goals, and more). Read on to discover why your business needs Snapchat, how the platform works, and what strategies will give your company the most success. The best part about Snapchat is that these weaknesses also serve as the platform’s greatest strengths—especially when targeting millennials. Snapchat allows your company to relate to consumers in a way that other platforms won’t allow, by being authentic. Authenticity in the social media world is something that’s hard to come by. Most likely, your consumers are already exposed to industry secrets. They know that the majority of images are filtered, photoshopped, edited, and reconfigured to contribute to the “perfect” post. But Snapchat isn’t like this. Snapchat allows real-time content your consumers can believe in and relate to. Millennials account for more than seven in 10 Snapchat users because they’re drawn to the authenticity of this platform. A recent study conducted by Elite Daily revealed that when consuming content, 43% of millennials value authenticity over the content itself. And there’s nothing more authentic than the short-lived, anything-can-happen, behind-the-scenes content that Snapchat creates. By the year 2020, millennials are predicted to spend $1.4 trillion annually, which is 30% of all retail sales in the U.S. The numbers don’t lie. If your business doesn’t have a Snapchat account, or has one that isn’t impactful, it’s time to make a change. Before your business can become a top account to follow on Snapchat, it’s important to familiarize yourself with the basics of this platform. This means first understanding the basic buzz words. Read on to brush up on your Snapchat vocabulary. Snap is a term coined to define the pictures or videos that you send to other users on Snapchat. 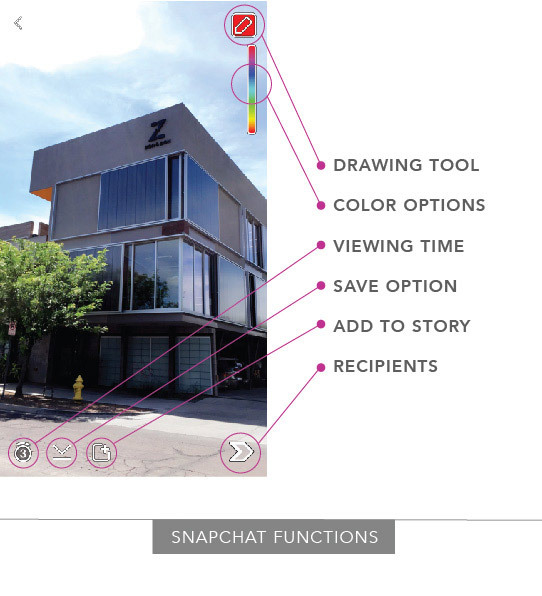 A snapchatter is an individual that is an active user of Snapchat. Snapback is a term used when you send a snap back to an individual. A snapcode is a unique image that every user is assigned upon registering for Snapchat. It helps to simplify the process of adding new friends. To use, instruct your potential followers to simply point their Snapchat camera at your snapcode and tap their screen to add! Pro tip: Take advantage of your snapcode by posting it on your different social media accounts. This helps to gain traction from individuals that may have not known that your company is on Snapchat. Every snapchatter has a unique score tied to their account. Your score is the combined number of snaps that you have both sent and received. Snapchat keeps track of your score by adding one point for every snap you send and one point for every snap you receive with the exception of Snapchat stories, which are worth zero points. To find your personalized score, click the ghost icon at the top of your screen and find it listed underneath your snapcode and by your username. A screenshot on Snapchat is when you take a picture of a snap that somebody sends you or when somebody else takes a picture of the snap you sent them. Either way, the image shows the content of your phone’s display, automatically saving it in your camera roll. 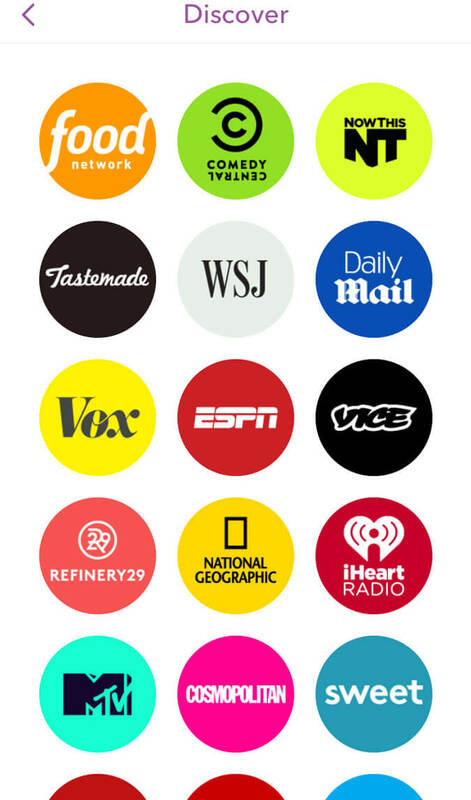 Snapchat stories are ideal for gaining audience interaction and traction. 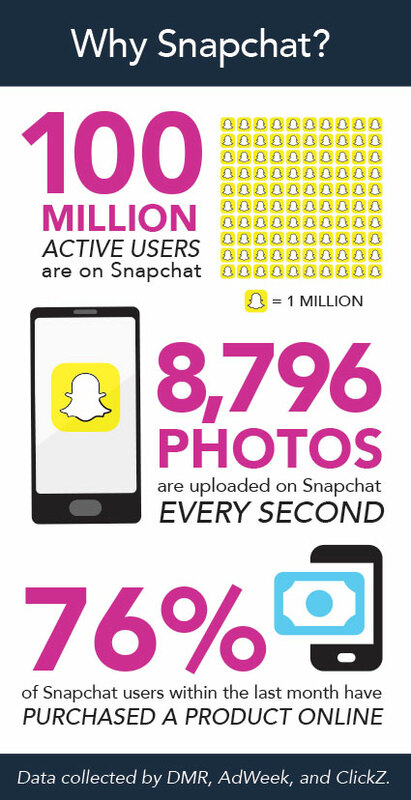 One billion Snapchat stories are viewed every day, which proves the relevance of this feature. A story is composed of a string of snaps that create your own personal narrative. And, to keep the content moving, Snapchat only allows your story to be viewed for a maximum of 24 hours. Snapchat stories are also useful for providing important feedback and data. For example, during any time that your snap is posted, you can see exactly how many people viewed it, their usernames, and if anybody screenshotted your story. This tool is especially useful for businesses because it allows you to modify your posts based off of what Stories receive the most attention and at what time(s). A live event is a Snapchat story told from the community’s perspective. This lets users from around the world have the luxury of experiencing an event through live stream without actually being there. If you’re looking to make an addition, make sure that your location service is enabled at the event and Snapchat will automatically give you the option to contribute. …and many more. Each publisher’s edition refreshes every 24 hours, allowing users to discover daily creative content. Filters let you change the look of your Snaps. By simply swiping left or right, you are granted access to different colored filters, the local time, the temperature powered by The Weather Channel, and varying effects to apply to your videos, including fast and slow motion. If you downloaded Snapchat without the filter feature pre-installed, then follow these step-by-step instructions on enabling filters. Pro tip: You can easily stack filters by holding down one finger when you reach the filter you desire and simultaneously swiping left or right to add an additional filter. Geofilters are similar to the filter feature on Snapchat, except for the fact that they are correlated to your specific location. 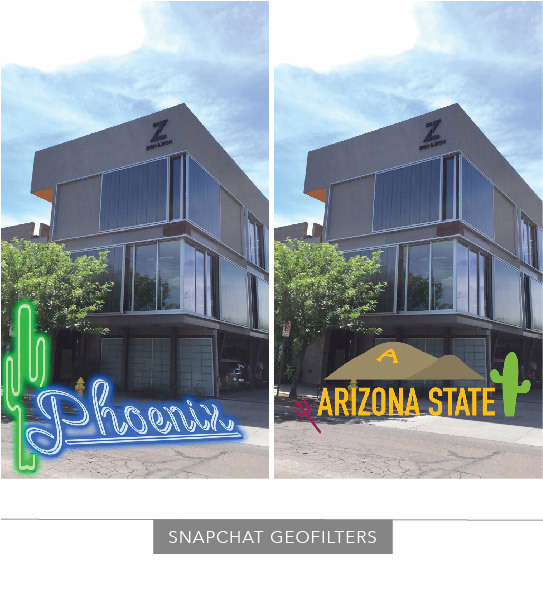 For example, here at the Zion & Zion office in Tempe, Arizona, we have access to Geofilters from Arizona State University, and Phoenix. Pro tip: Snapchat allows you to customize and create your own geofilter. 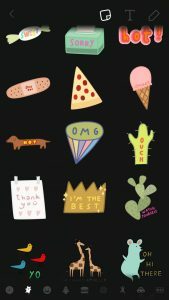 If you’re wanting to try one out for your business, you’ll want to make sure your creation abides by Snapchat’s Geofilter Submission Guidelines before you submit your design. Lenses are (often) goofy animations that allow you to augment your selfies and add life to your pictures or videos. To add this feature to your snap, tap the screen for the lens to recognize your face, scroll through the available animations, and select the desired lens to apply. To see the lenses in action, check out 8 Celebs Who Love Snapchat Faces. Coming in large sizes, stickers are a great way to liven up any snap. After perfecting your photo or video, use stickers to express your creativity and originality. To use, just tap the square box at the top of your screen. Once the box is selected, a dropdown display will immediately appear, allowing you to choose from unlimited emoji options. Drawing is a feature on Snapchat that allows you to creatively doodle on your videos or pictures before publically posting. To draw, tap the drawing tool symbol on the top right hand corner of your screen, select a color from the color ribbon, and use the tip of your finger like a paintbrush to express your creativity. To stay up to date on the rest of your social media vocabulary, visit Social Media Definitions: The Ultimate Glossary of Terms You Should Know. Asking yourself these questions before diving into the details puts you in the right mindset to make strategic decisions that’ll benefit your company in the long run. To inspire your brainstorm, I’m sharing the top ways to captivate your consumer on Snapchat. Follow along to perfect your business’s Snapchat strategy. Your Snapchat followers are likely some of your most loyal customers. They already follow you on all your other social media platforms. They already know who you are as a company. And, they most likely have already seen all the content you’ve generated. These users are following you on Snapchat because they want to gain an additional, personal perspective into your company. This is why going behind-the-scenes is the perfect way to capture your audience’s attention. Take this time to show off what’s relevant within your company. Film the shipping process of a best-selling product, show off some behind-the-scenes moments from your latest photo shoot, or take your users on a walk through your newly remodeled headquarters. Whatever it may be, just make sure your content is something your users can’t get anywhere else. 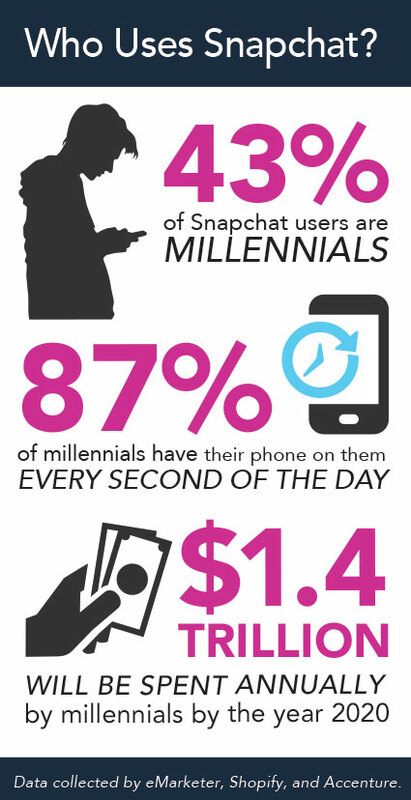 Snapchat is popular because the pictures and videos featured are typically quick, fun blurbs. In fact, this is the entire premise of the social media platform. Users want to see exclusive, real-time content that only lasts 10 seconds per snap, and 24 hours per story. In order to captivate your consumers, make sure your company’s Snapchat falls in line with this strategy. Don’t overthink this tip. There’s no predetermined rule about the number of snaps you should post or the amount of time your stories should take in order to catch your user’s attention. Instead, just think about keeping it short, sweet, and exciting. By giving your users the creative content they desire, you’ll have an engaged, loyal following in no time. As a business owner, you’re probably already aware of the effectiveness of a good promotion, perk, or giveaway. They can help grow your business quickly and at a relatively low cost. The same logic applies to Snapchat. Offering up an exclusive promotion or giveaway will help to draw in your consumers. Snapchat is able to take this strategy and put a spin on it like no other platform can. Due to the short-lived content of this platform, your offer will only be available for 24 hours. This makes use of scarcity, one of Cialdini’s six principles of influence, making the deal feel exclusive to the user, prompting them to purchase now or never. Additionally, Snapchat gives you the ability to interact with users in a new way. Try asking your followers to Screenshot their favorite product for a chance to be chosen for a giveaway. Or request that they send you a Snap of how they would use a new product for the opportunity to get an exclusive discount code. By offering limited deals and giveaways in a personal way, your users will feel as though their voice is heard and that they’re important to your company. Do you ever remember being teased as a kid with the saying, “you can look, but you can’t touch”? Do you remember being even more drawn to that forbidden item after being told this? Well, not much has changed since then. The concept still works. Take this concept and run with it. Whenever you receive a new shipment of products, take to Snapchat to hype up the launch. Demonstrate how to use the product, what packaging it will come in, and when the release date will be. Allow your users to look, but not touch until they purchase themselves. This will help to draw in your users and get them excited for your up-and-coming product. Getting the attention of your pre-established audience is only half the battle. Engaging new users is a completely different story. One tactic for gaining new followers on Snapchat is to partner up with relevant influencers. Let individuals in the limelight “take over” your Snapchat account to help spread the word about your company. To ensure this strategy goes off without a hitch, there are a few important elements to take note of before moving forward. The first is to make sure that your influencer of choice is relevant to your brand. Users tend to connect with those they idolize or relate to. So if your influencer’s personal image falls in line with what you believe to be your core customer’s current or desired image, they’re most likely the perfect person to partner with. Secondly, it’s important to spread the word about this “takeover.” You don’t want to have your influencer use your Snapchat account out of the blue. Instead, take the time to promote your partnership and transform it into an event that your followers can partake in. For instance, announce the partnership on your other social media platforms to gain the attention of your pre-established audience. Next, prompt the selected influencer to post on their social media accounts to engage new users that maybe haven’t heard of your company yet. If all goes well, you’ll be given the opportunity to turn those new users into pre-established, brand-loyal consumers. A call to action (CTA) is an instruction used by a company to provoke an immediate response from their users. And if you aren’t currently using CTAs in your social media marketing efforts, it’s time to make a change. Start off small and simply ask your Snapchat followers for something in return. Ask them to Screenshot their favorite product or respond to your post with the ultimate doodle of your company’s logo. You can also take this time to think outside of the box and get creative. If your company has a great corporate culture, ask your followers for advice on what your next themed work event should be. And if your company is looking for inspiration for a new blog, ask your users what topics they like best. Whether it’s a small or large request, this strategy will make your audience feel as though they’re a part of your company. And ultimately, it allows them to quickly identify with your brand. So there you have it. All of the information you need to promote your business on Snapchat. All that’s left for you to do is to get started! Have questions or comments on using Snapchat, or any other social media platform, for your business? Tweet us at @ZIONandZION. We’d love to chat about all things Snapchat.